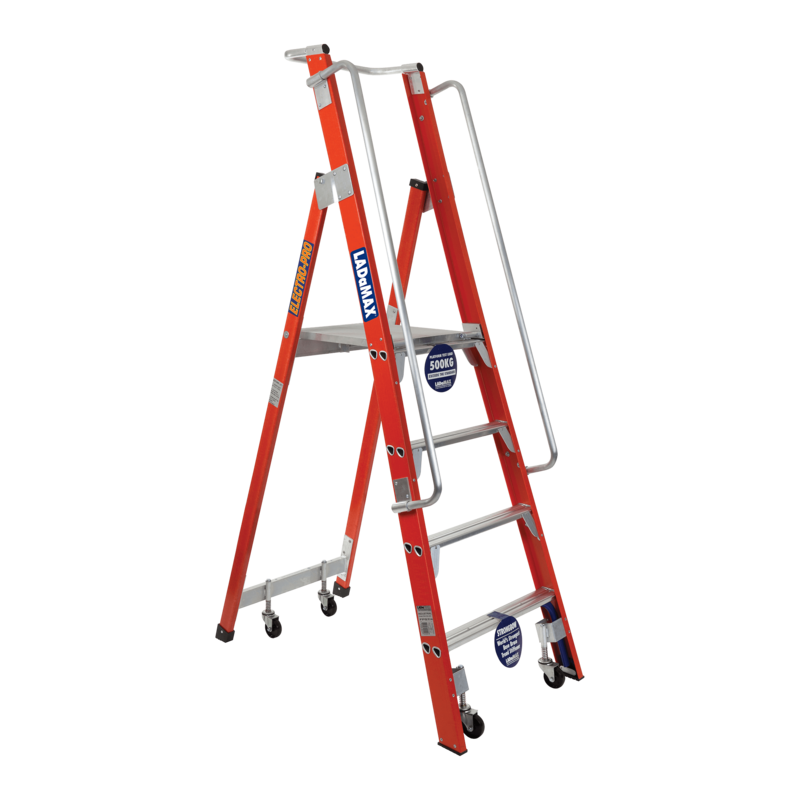 Our Fibreglass Mobile Order Picker Warehouse Ladder Range is a lightweight yet rigid step ladder designed for Australian professionals seeking the ultimate in height safety, for use where electrical hazards exist, complete with castor bit and handrails. Made from non-conductive materials, our Fibreglass Mobile Order Picker Warehouse Range is designed to ensure those working with electricity remain safe from start to finish, making it perfect for electricians, as well as those working in an environment where electrical accidents may occur. Our extended platform is made from fibreglass (not plastic) to ensure it lasts when exposed to the harsh Australian UV climate. 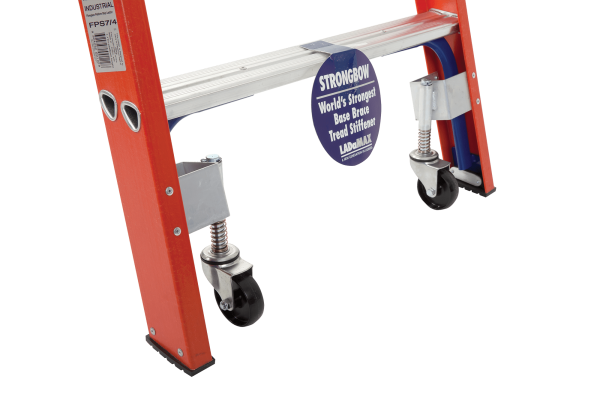 Additional rib support is included to add extra support and strength, while m12 solid fasteners connect to the side rail. 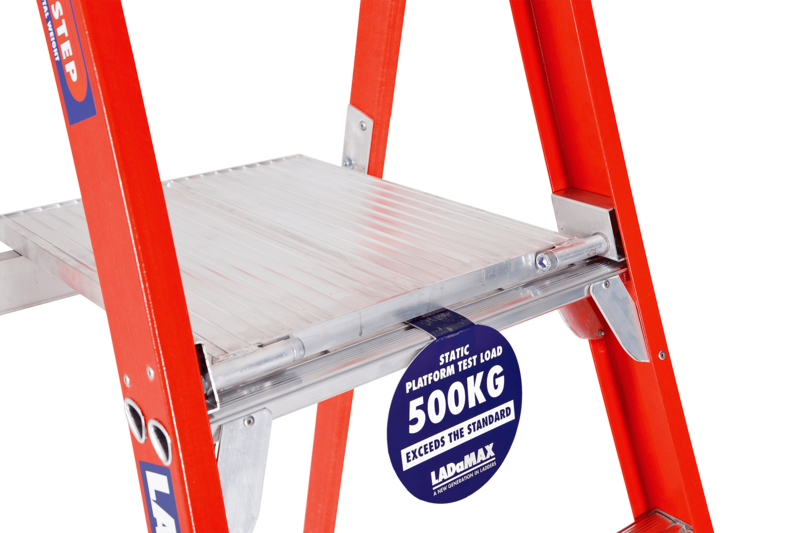 Like all of our ladders, our Fibreglass Mobile Order Picker Warehouse Range is equipped with our signature safety feature, ‘Swagelock’ which ensures 50% extra strength. 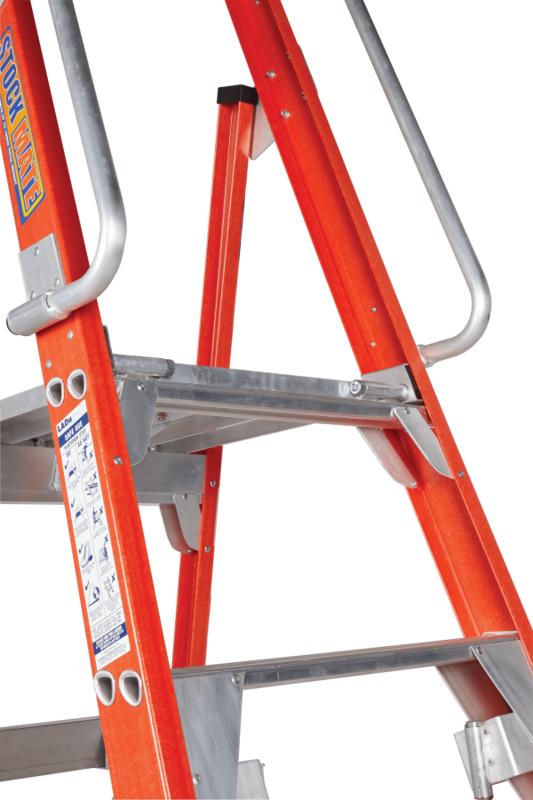 The Swagelock method is different in that it does not require the use of ‘rivets’ when connecting step treads or rungs to the ladder side rails. Thanks to Swagelock, tortional rigidity is increased, twist is reduced and the risk of tread or rung collapse is eliminated, effectively reducing the risk of workplace accidents, as well as increasing the lifespan of your product. In the event of a huge overload, Ladamax step tread will only bend, unlike others which may collapse completely. Double hollow extrusion is also in place to maximise strength on every Ladamax platform within our range, and increased tortional rigidity and reduced twist (with no rivets to shear) add an extra level of safety. 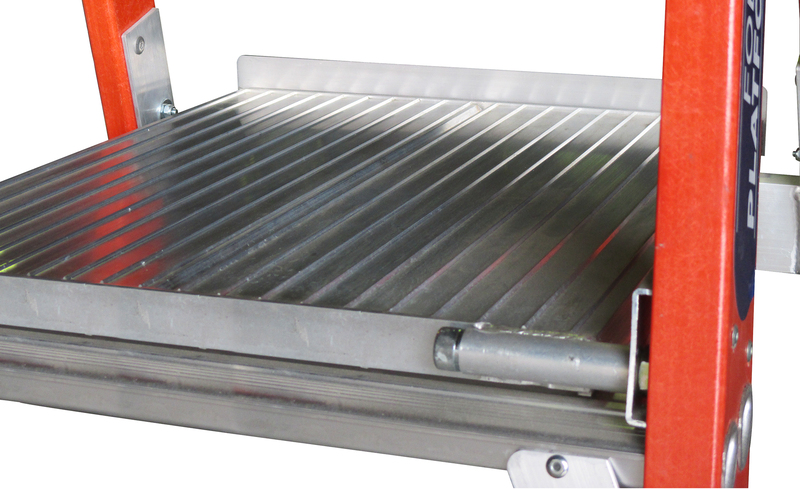 Other safety features include a stronger full gusset base brace system to ensure a solid foundation (“Gusset Gutz”) up to and including 6ft platform height with the Strongbow system used for those above 6ft, a double hollow step tread processed and swaged through side rails for added strength, a failsafe step that can never shear under normal use, no rivets to shear or rust, no holes to elongate, the strongest plated foot connection, complete mobility castors, as well as stronger safety rail grip fully integrated handrails. All of our ladders are stress tested to 150kg to ensure maximum safety for our users as per the AS 1892 safety standard which sets out the minimum recommended safe practices and requirements for the selection, use and maintenance of portable ladders, but when put to the test by our in-house manufacturing team, our Fibreglass Mobile Order Picker Warehouse Range were actually able to withstand a load of up to 500kg without warping or bending. 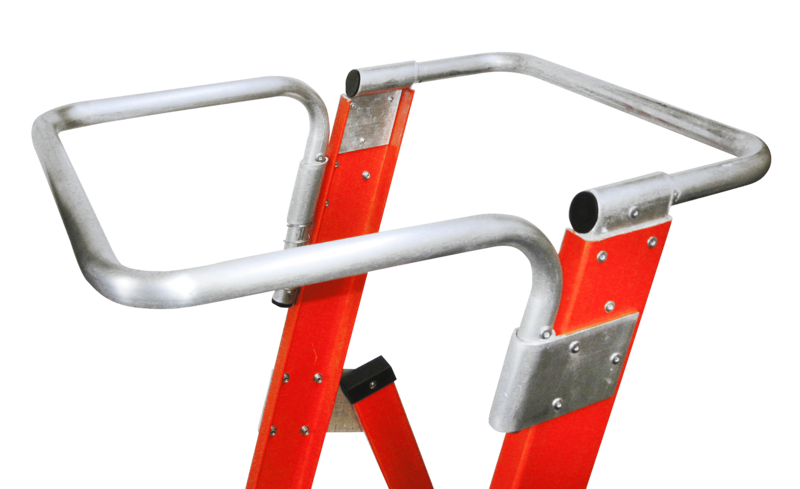 Our Fibreglass Mobile Order Picker Warehouse Range is lightweight and portable without compromising strength or durability, making it the first choice for companies, contractors and professionals looking to create a safer workplace.